You can create windowing models in which you can define a series of time/depth windows that are bounded by constant time/depth values and/or horizons. Windowing models are useful for Spectra Analysis and other filtering processes where you can clip the volume traces based on different windows. At the tab header, click the Add icon and select New model. Type a name for the new windowing model and click OK. 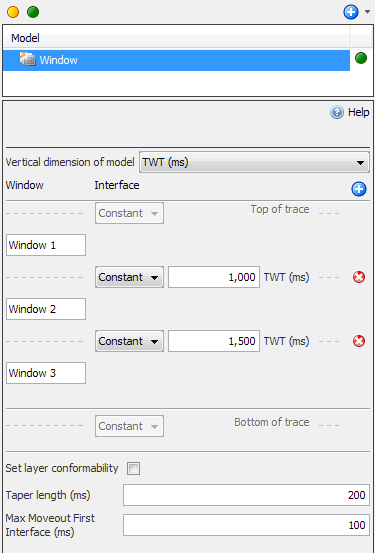 In the Details Panel, select TWT (ms) or TVDSS (m) at Vertical dimension of model to create the windowing model in the time or depth vertical domain. Once you have selected the vertical dimension, you can define more parameters for the windowing model. Click the Add Row icon to add a window in the windowing model. In the above example, there are three windows in the model: "Window 1", "Window 2" and "Window 3". Under the Interface column, select Constant and type a time value to constrain the window to a constant time value. For example, "Window 1" will clip traces from top of the trace to a time slice at 1,000 ms. Alternatively, you can select Horizon and select the horizon to be used as a boundary in the window. For example, if you select to use "HorizonA" in "Window 1", traces will be clipped from the top until the interface intersects with HorizonA. If you select Horizon, you can also type a time value to associate with the horizon. Repeat step 6 to define the boundaries for each window from the top to the bottom of the trace. Click the Remove Row icon to delete a window in the windowing model. Top — Stratigraphy follows the top horizon, truncated at base. Base — Stratigraphy follows the base horizon, truncated at top. Proportional (default) — Stratigraphy compresses and expands to fill layer. Taper length (ms) specifies the ramp applied to layer boundaries. A larger value results in a smoother model. Type the Max Moveout First Interface (ms) value. This value indicates the "droop" at the maximum offset (or other fourth dimension in the model) at the first defined interface. Note that as the offset (or other fourth dimension) increases, the time window "droops" with the moveout. The "droop" at the maximum offset at the last interface is hard-coded at "10 ms". Tip: For more information on windowing models, click on the Help icon.